Three generations of ffrench family members contribute to the amazing collection of 13 hand screen printed pieces of art that come packaged as our wonderful 12" x 24" Dolphin Studio Calendar. 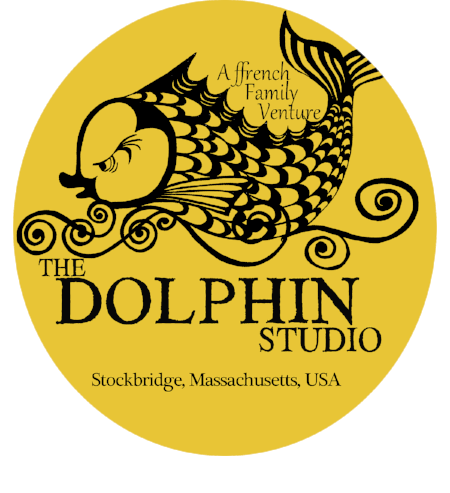 The Dolphin Studio was started by John and Primm ffrench as newlyweds in Ireland in 1962. Once the family moved to Stockbridge, Massachusetts they delved deep into screen printing. John and Primm, both professional artists, gave their handmade calendars as very well received gifts for about a dozen friends. Since then, our annual edition has grown to 2000+ hand screen printed calendars that are sold and shipped all over the world.